Product #21890 | SKU PB70-A7S | 0.0 (no ratings yet) Thanks for your rating! 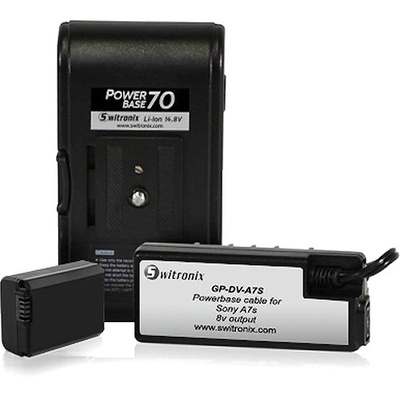 The Switronix PowerBase 70 Battery for Sony a7S (12" Cable) attaches on the bottom of the camera as a battery grip using an included mini quick release plate, and connects to the camera via a battery paddle. It consists of a 14.8V, 77Wh lithium ion battery and a regulator block with a battery paddle. The regulator block attaches on the side of the battery when the battery is mounted as a grip. Two P-Tap outputs are available for powering 12V accessories and can also be used for lower voltage accessories if you incorporate optional XP power regulation cables. A V-mount adapter on the back of the battery allows direct connection to V-mount plates.